Are you a fan of cold brewed coffee? 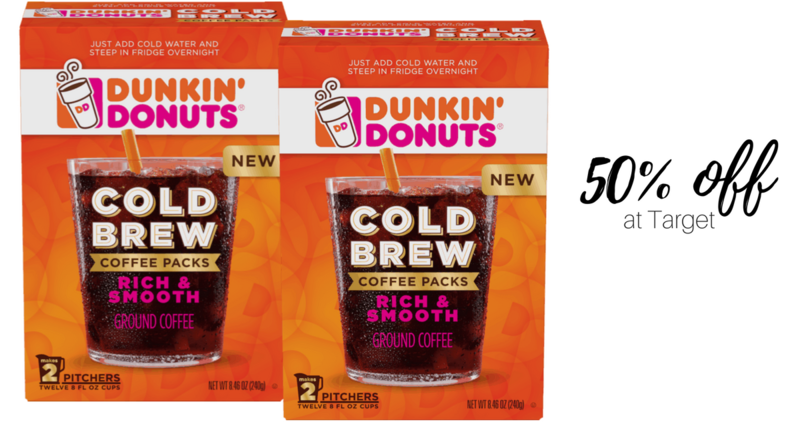 Print a new Dunkin’ Donuts coupon and get over 50% off Dunkin’ Donuts Cold Brew coffee packs at Target. With two packs you’ll be able to make two pitchers of coffee or the equivalent of 12 cups of coffee! That’s 28¢ per cup! Sure, you can get other deals to make coffee for less than that a cup, but if you’re into fancy coffee brewing, then this is a great deal to grab. There is a $2 off coupon in the RP 09/24 insert, but if you don’t get inserts, then the printable coupon is the best way to go.